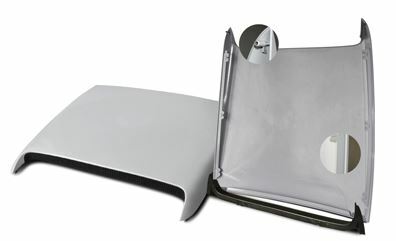 Give your cars' front end an upgrade with this universal hood scoop from SLP. The OEM quality injection molded composite material makes it durable and strong, so it'll last a long time. It takes 30 minutes to install and is ready to be primed, prepped, and painted. It comes with all the necessary hardware and the instructions are included. Note: Make sure to trial fit before you prime and paint it. May require drilling through the OEM hood or relocating of wiper nozzles depending on where you're locating the hood scoop.